The Koyo engineering team develops highly detailed plastic tank molds which include critical features such as structural reinforcements, supports for coolant return lines, fan mounts, and coolant reservoirs. These details result in why Koyo products are the industry's best fitting and performing aftermarket radiators. Koyo manufactures under strict quality control and careful packaging. This results in tubes and fins with optimal coolant flow and efficient heat transfer. Koyo packages each radiator securely by strapping each one to rigid cardboard, then supporting delicate areas such as the inlet and outlet, heater tubes, filler necks, etc. These measures ensure safe delivery of Koyo products. Koyo keeps current with state-of-the-art machinery and building procedures assuring our users the best in quality. Koyo is one of the few aftermarket manufacturers with the capability of reinforcing our header plates for strength and durability like the OEs Reinforced header plates provide increased surface area for support where higher than normal internal pressure exists. Whether your vehicle requires a concentric/plate transmission cooler and threaded UNF, UNEF, NPTF or Quick Disconnect socket type, Koyo has got you covered. 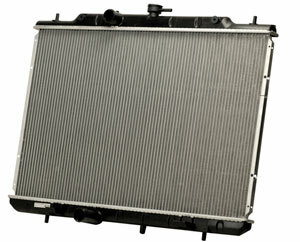 Each radiator is made to OE specifications for a quick and pain-free installation. Koyo die cuts each header plate with state-of-the-art machinery. Before final assembly, each one is hand inspected for accuracy and cleanliness to assure a tight seal with the O-rings and plastic tanks.